This is SmartAsset’s third annual study of the best cities for tech workers. Read the 2015 study here. 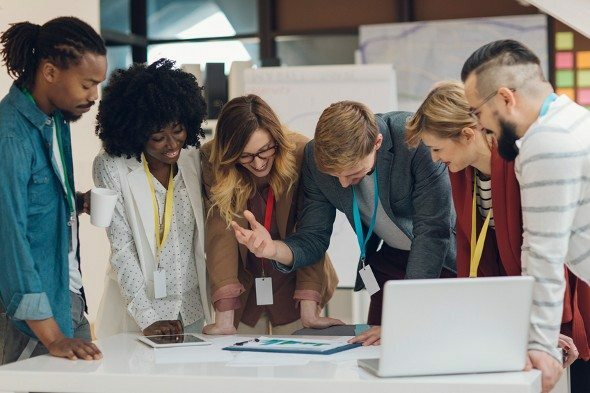 Tech jobs are some of the most desirable positions in the American labor market, spawning a whole cottage industry of schools that will retrain you to join the tech world. Though tech companies tend to keep their employee rosters lean, there are more tech jobs than ever – and not just in San Jose and San Francisco. 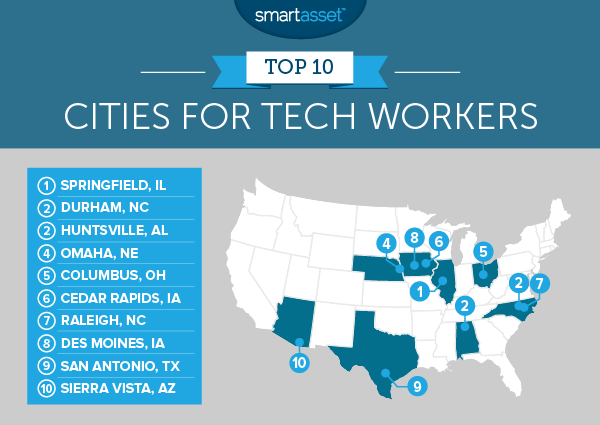 SmartAsset crunched the numbers to find the best cities for tech workers in 2016. We didn’t factor in tech company perks like ping pong tables and 401(k) matching but we did look at five metrics that make a city desirable for tech workers. This year’s study of the best American tech cities used the same five factors we included in the 2015 edition of the study. Those factors were: the percent of the city’s employed population that is working in tech; the ratio of the average tech salary in the city to the average salary across all jobs in that city (the wage ratio); the cost of living; the unemployment rate for workers with Bachelor’s degrees; and the median income for tech workers. For all factors except the cost of living and the unemployment rate, a higher number helped a city rank higher in our study. Check out the full study specifics below. Looking to move? Check out mortgage rates in your new area here. The Midwest is a tech-friendly region. Think the West Coast is the country’s tech worker paradise? Think again. When SmartAsset ran the numbers to find the best cities to be a tech worker, half of our top ten cities were in Midwest states. The low cost of living and relatively high salaries helped the region dominate our list. Iowa and North Carolina are big tech states. The only states to have two cities in our top ten were North Carolina and Iowa. North Carolina didn’t have any cities in the 2015 top ten but Durham and Raleigh both ranked high in this year’s study. The tech boom expands to the Southwest. North Carolina wasn’t the only new state to crack this year’s top ten. Arizona wasn’t represented in our 2015 top ten list but this year came in 10th, with Sierra Vista. According to the numbers, America’s tech boom is more geographically diverse than the Silicon Valley stereotype. This year’s number-one city for tech workers is Springfield, Illinois, which rose from its number-three position in last year’s study. What makes Springfield so great for tech workers? For one thing, the cost of living in Springfield is 11.1% below the national average. That means the median tech salary of $83,520 goes a long way in Illinois’ capital city. Just 2.8% of Springfield’s population is employed in tech, but those lucky residents earn an average salary that’s 1.71 times the city’s average salary for all workers. Also, the unemployment rate for workers with a Bachelor’s degree is just 2.6%. Tied for second place are Durham, NC and Huntsville, AL. They earned the same score in our study (96.6) though Durham boasts a lower cost of living and a lower unemployment rate for BA-holders. Want to move to Durham and work in tech? The median salary is a tidy $91,560. That’s 1.61 times the city’s overall average salary. Huntsville, AL is the only Deep South tech hub on our top ten list. 5.9% of the city’s workers are employed in tech, earning an average salary that’s 1.76 times the average for all jobs. The cost of living in Huntsville is higher than in Durham, but the median tech salary in Huntsville ($92,480) is higher, too. Last year’s number-one city for tech workers, Omaha, NE has a lot going for it as a tech city. Its unemployment rate for BA-holders is a low 2.6% and 3.77% of the city’s workers are in tech. Tech workers in Nebraska’s largest city earn a median salary of $75,890. That may be the lowest median tech salary on our top ten list, but it’s 1.69 times the city’s average salary. Ohio’s capital city came in fifth on our list of the best American tech cities. 4.12% of the city’s population is employed in tech, earning a median salary of $80,320. That’s 1.69 times the city’s average salary, and should go pretty far considering the cost of living in Columbus is nearly 10% lower than the national average. Located in Iowa’s “Creative Corridor,” Cedar Rapids has made a name for itself lately as a land of opportunity. Nicknamed the City of Five Seasons™ Cedar Rapids has a tech workforce that makes up 4.24% of the city’s employed population. The unemployment rate for BA-holders is just 1.99%. That’s the 13th-lowest of all the cities in our study. In last year’s study Raleigh came in 25th but this year it cracked the top ten to come in at number seven on our list. Tech workers in Raleigh earn a median salary of $85,370. 5.21% of the city is employed in the tech sector, where the average salary is 1.76 times the city’s overall average. The cost of living is 9.5% below the national average and the unemployment rate is under 5%. The second Iowa city on our list is Des Moines, where among other features of the tech landscape is a 570,000-square-foot Microsoft data center (still under construction). 3.45% of Des Moines’ workforce is in tech, earning an average salary of $77,800. That’s 1.65 times the city’s average salary for all jobs. Not sold on Des Moines yet? The city’s cost of living is over 10% below the national average and the unemployment rate for BA-holders is just 2.67%. Think Austin is the best tech city in the Lone Star State? Well, San Antonio edged out Austin to claim the title of the only Texas city on our top ten list. 3% of San Antonio’s workers are in tech. The median tech salary of $84,070 is a whopping 1.92 times the city’s average salary for all work. 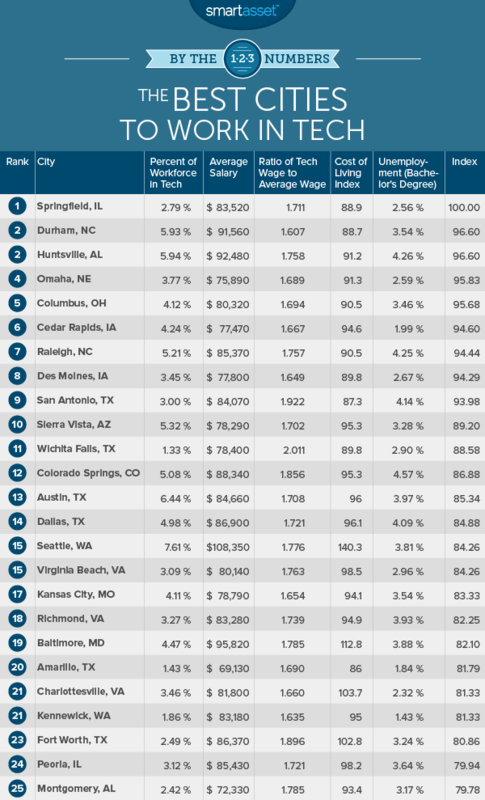 That’s the fourth-highest wage ratio of any of the cities in our study. The other good news? The cost of living in San Antonio is the lowest in our top ten. Located in southern Arizona, Sierra Vista is a budding tech city with an educated population. 5.32% of the workforce is in tech, where the median salary is $78,290. That’s 1.7 times the average salary for all workers in the city. The cost of living in Sierra Vista is 4.7% lower than the national average and the unemployment rate for BA-holders is 3.28%. To find the best American cities for tech workers, SmartAsset collected data across five metrics. Three of the five factors were specific to the tech sector. They were: the percentage employed in tech, the median salary of tech workers and the ratio of the average tech salary to the average salary across all fields. Data on these three factors came from the Bureau of Labor Statistics. To get a sense of the overall economy in the cities we studied, we then pulled data on two other factors that are not specific to the tech industry but that go into making a city a good place for tech workers to live. Those two factors were the cost of living and the unemployment rate for people with a Bachelor’s degree. The cost of living data came from an index compiled by the Council for Community and Economic Research. The unemployment data came from the U.S. Census Bureau. For each of the 201 cities that had data for all five factors in our study we assigned a rank on each of the five metrics. For the unemployment rate and the cost of living, cities with a lower number ranked higher. For the other three factors, a higher number helped a city rank higher. We then averaged those five ranks for each city, giving each factor equal weight. Each city’s average rank was used to assign a score from 0 to 100. The city with the highest average rank got a score of 100 and the city with the lowest average rank got a score of 0, with the remaining scores distributed evenly between 0 and 100.